At Substance, we’re constantly thinking of ways to empower people to experience success. 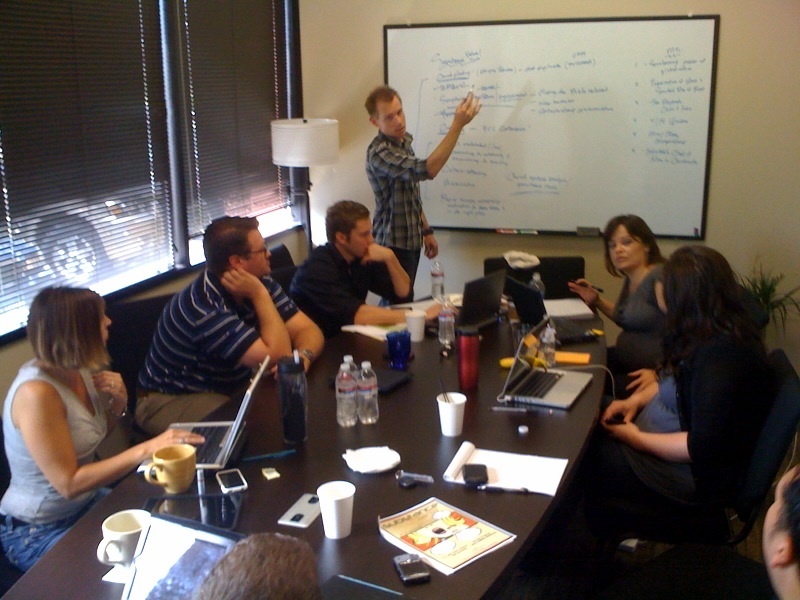 And we have a crazy ministry launching at our Operating Center this coming week called Financial Peace University (FPU). Of course, our goal as Christians isn’t to store up treasure on earth. Some people believe in a “prosperity gospel” which is basically an excuse to live a self-centered American life that sugar-coated in Christianity. However, the Bible teaches that if we can be a conduit of life to those in need (emotionally and financially) only then can we experience God’s best (Prov. 11:25-26). And that’s really our heart behind these amazing and fun financial classes at Substance. One of the biggest misconceptions about the FPU class is that you have to be poor, broke or financially crushed to consider attending. Of course, that’s not the case at all. Some of you might be unemployed or underemployed and at the end of your rope with interest rates and debt collectors; yet others of you might earn a HUGE income and can afford to maintain a debt load. But here’s the deal: Just because someone can maintain a huge debt load doesn’t mean that they aren’t living outside of their means. (Can we all agree that our country and our government has struggled with financial management?) We’ve been bombarded with partisan politics about our National Debt, extending credit limits, downgrades in credit ratings, and the government shutdown. The average credit card debt per household with credit card debt is $15,799.00! There are 609.8 million credit cards held by U.S. consumers. ·The average number of credit cards held by cardholders is 3.5. ·The average APR on a new credit card offer is 14.89 percent. ·The average APR on a credit card with a balance on it is 13.10 percent. 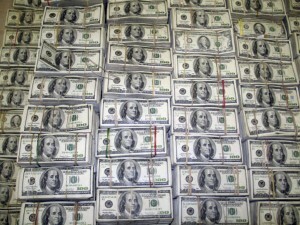 ·The total U.S. revolving debt (98 percent of which is made up of credit card debt) is $793.1 billion, as of May 2011. 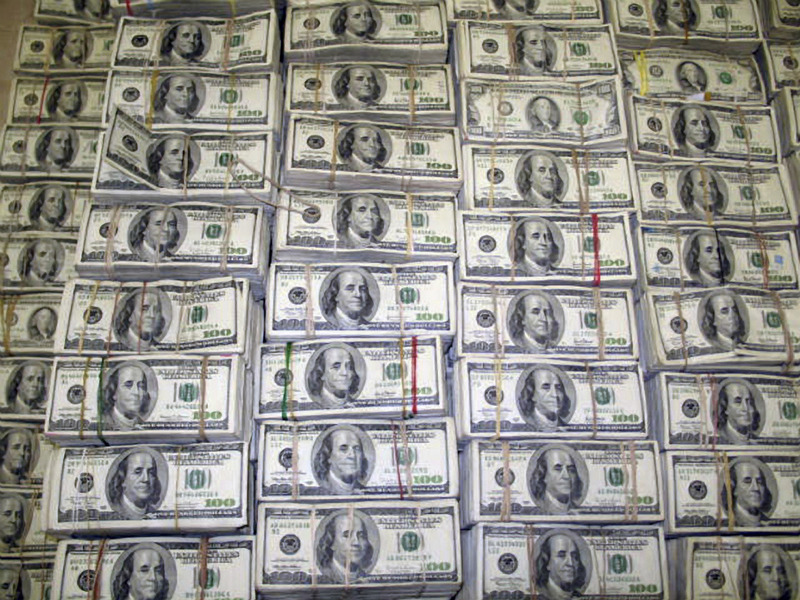 ·The total U.S. consumer debt is $2.43 trillion, as of May 2011. If we aren’t intentional about managing our finances, no matter where we are in our finances, we build financial pressure, increase our stress, and decrease the margin in our lives for doing things like ministry, and building community with close Christian friends. Do you realize that about 40 to 50 percent of married couples in the U.S. end up in divorce – and one of the leading causes of divorce is financial stress? Remember, it’s not how much you make, it’s how much you spend. Financial pressure and stress will steal your joy and your margin in life whether you are broke or earning a significant income. FPU is as much about managing your life, happiness, finances and spending habits once you are out of debt, as it is about getting your life in order and climbing out of debt. So if you sign up, here’s what you’ll learn: You’ll learn how to beat debt, build wealth, find bargains, invest for the future, give like never before, and much more! Seriously: It’ll change your life. You can check out the full lesson plan here: http://www.daveramsey.com/fpu/preview/. And in case you’re wondering if it works: More than one million families nationwide have attended Financial Peace University with amazing results. On average, these families paid off $5,300 in debt and saved $2,700 in just the first 90 days. That’s crazy! In end, we could do so much more for our families, community and for the kingdom if we could get our financial house in order and stop worrying about money. Classes start at the OC on October 4 at 7pm. Pre-registration for FPU is required, so check out the Substance Magazine or http://www.substancechurch.com/ministries/subgroups for more details on how to sign up. I love you guys. We have limited slots so start your journey to Financial Peace today! Is the Rapture Coming this Saturday? When Rob Bell’s Love Wins hit the shelves, I thought that there would never be an end to the questions: “Pastor, what do you think? What are your thoughts?” (And by the way, if you really want to know my thoughts on hell, check out the four-part series: “Hell, Fuzzy bunnies and Brimstone” from Easter 2010). But finally, (and thankfully) another topic has eclipsed this… specifically, the rapture that’s supposedly coming this Saturday! (1). Pre-millennialism, is the most popular right now – thanks to the “Left Behind” series. It’s the oldest interpretation from a historical standpoint. And it’s the only one that talks of “raptures” and tribulations. In short: It’s the “World is getting worse & worse” Interpretation. And right near the worst part (the tribulation) God is going to “rapture” his faithful followers into the sky (either before the tribulation, during, or after)… and the only one left will be… Kirk Cameron!? After this Seven-year Tribulation, it gets a bit confusing because: Christ returns again (& this time it’s the official “Second Coming”) in which he re-establishes a 1000 year utopian reign. And then, Satan gets released again. (I realize it sounds redundant). But after Satan’s second little rebellion gets crushed, then the judgement happens and eternity ensues. (And Keep in mind: I’m not making fun of this complexity… I’m just trying to keep it light-hearted). (2). A-millennialism, has been the most popular since 200 A.D. up through the 1800’s. Although I’m oversimplifying — it’s a pretty simple and linear concept – especially compared to Pre-millennialism. There are no dramatic raptures. There are no complexities with Israel or temporary utopian “reigns with Christ” (most of which come out of Pre-millennialism above). Rather, God just shows up (the second-coming) and we all face judgement. Then: Eternity, here we come! (3). Post-millennialism is often called the “positive” approach to end-times. It’s the belief that things get “better and better” as the power of the Holy Spirit slowly takes over the earth as a fulfillment of Acts 2. And after the unstoppable wind of the Spirit prepares the bride of Christ, Christ comes for his bride and ushers-in eternity. Of course, the “pessimistic” (Pre-millennial) interpretation is so popular right now that most Christians have never even heard a whole lot of the Biblical arguments for Post-millennialism. This was the most popular interpretation throughout the 1800’s. But after the two World Wars most Christians concluded that the world is more screwed up than ever. (Hence Pre-millennialism was revived). Of course, due to the massive growth of the Christian church globally, many have started subscribing to this approach again. In fact, based on Christian conversion growth in the past two decades, Christians could overtake the entire population of earth by 2030. When missiologists started reporting this, many Christians thought: “perhaps our eschatology is a bit too attached to headlines rather than hermeneutics (a.k.a. a fair interpretation of scriptures). However, Post-millenialism is a rather “new interpretation” compared to the other two. (I.e., it’s hard to find much historical support for this in the first century). Yet many Christians still feel it’s the Biblical interpretation that gives the least amount of glory to the devil. “But Peter: What do YOU think? And more specifically, do YOU think the rapture is this Saturday?“ Truth be told, I’ve done a lot of pendulum swinging between each of these theological approaches. Honestly there are a lot of really smart people who’ve written some pretty incredible treatises on this. I’m a church-growth expert not a theologian. Yet, the historical foundation of pre-millenialism is pretty solid. And it’s hard to think about the modern state of Israel without getting a few “Premillenial Goosebumps” on your arms. But seriously… I honestly still don’t know. Don’t get me wrong: I have a detailed opinion. However: We prepare for all three of these the same – by repenting and looking forward to Christ’s return. And no matter which you subscribe to, all three believe in the immanent return of Christ and the Judgment to come. So in some ways… who cares!? Get busy living for God. And keep preparing Christ’s bride for His return! Honestly, when I read much of Camping’s literature on a 5-21-11 rapture, I thought he was making some pretty huge assumptions. And more: I still think “No one knows the day or hour when these things will happen” (Mt. 24:36). But I sensed the Holy Spirit impress upon my heart: “Peter, live as though it could happen this soon.” And honestly it’s been an overwhelming couple of days. I think it’d be pretty awesome if Christ did come. And if you don’t feel excitement about an imminent rapture this Saturday, it’s probably a sign that you have a few issues that you need to get straight with God. I’ve had an amazing number of God-discussions with my kids the last few days. And honestly my walk with God has never felt richer. And if there was a Saturday rapture my only regret would be that I haven’t lived my entire life with such an imminent vigilance. Besides: What if the rapture didn’t happen this Saturday… then suddenly, God came on Monday? Or what if it was one year out? Either way: God is giving each of us the same word: “Be careful how you live! Don’t live like fools, but like those who are wise. 16 Make the most of every opportunity in these evil days. Don’t act thoughtlessly, but understand what the Lord wants you to do” (Eph. 5:15-18). And Why? “For the Lord himself will come down from heaven with a commanding shout, with the voice of the archangel, and with the trumpet call of God. First, the Christians who have died will rise from their graves. 17 Then, together with them, we who are still alive and remain on the earth will be caught up in the clouds to meet the Lord in the air. Then we will be with the Lord forever. 18 So encourage each other with these words” (1 Thess. 4:16-18). 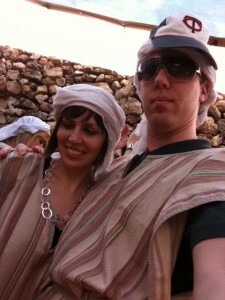 My Wife & I kickin' it Holy Land style. A trip to Israel wasn’t very high on my “bucket list;” but, after going there this last week, I honestly can’t believe I’ve waited this long. Seriously: I will never be the same. It sounds so sensational but it’s true. “And Why” you ask? I’ll tell you! Of course getting there was a nightmare! I’ve never had more flight delays and cancellations in my life. There’s actually a law stating that people cannot be stuck on an airplane tarmac for longer than 3 hours. If a plane is waiting to take off yet cannot, after three hours, they must return to the boarding gate. This happened over 3 times to my wife and me in a single day! (I.e., Nine hours on a non-moving plane). Amazingly this happened again the next day! (I.e., One short domestic flight took us 48 hours of airport travel – with no end in sight). We knew we were going to get stranded in Pittsburgh for a 2nd night so we rented a car and instead drove 8 hours to NYC just to hopefully fly standby on a 12 hr flight to Israel! As we drove across the Pennsylvania mountains we kept seeing signs for Scranton PA “The electric city”. I kept doing Michael Scott impersonations. And as we whistled the theme song to the t.v. show “the Office,” we starting getting high spirits again. Then BLAM! My wife gets pulled over! (Whistling stopped). So, after $600 of unexpected travel costs + 1 speeding ticket later, we stood at JFK airport at 1am. We waited in a two hour line with the hopes of merely flying stand-by. Of course, the story gets incredibly worse… (and the story home is equally outrageous.) But it suffices to say that: All of this trauma was worth it! And Why? I will never read my Bible the same. I had no idea how small the holy land really is. The Bible is constantly referring to cities in the land… and why? Because the land matters! When people read these references it dramatizes the plotline. Suddenly every Biblical battle becomes even more engrossing. 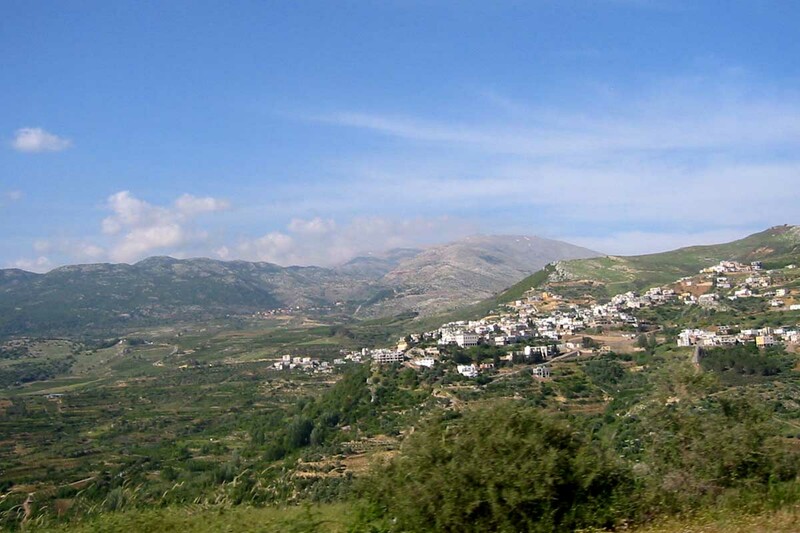 For example, the Garden of Gethsemene is only minutes away from a desert escape. King David would escape this way whenever the heat was on. Of course, this path was certainly a massive temptation for Christ when he prayed “not my will but yours be done.” He was literally only minutes away from total escape. Yet we would never know this until you’ve been there and understood how the terrain thickens the plot. 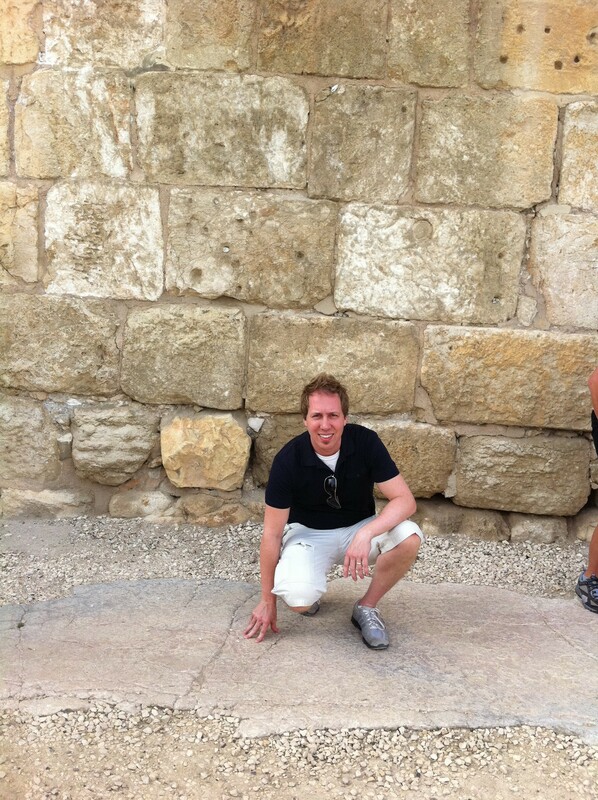 "The 1 place in Israel archaeologists can guarantee Jesus stood"
For example, I got to stand where the sermon of Pentecost was preached. I got baptized in the Jordan river. I got to boat over the sea of Galilee where Jesus calmed storms and walked on the water. I got to sit near Peter’s house in Capernaum where the paralytic’s friend’s ripped through his rooftop. 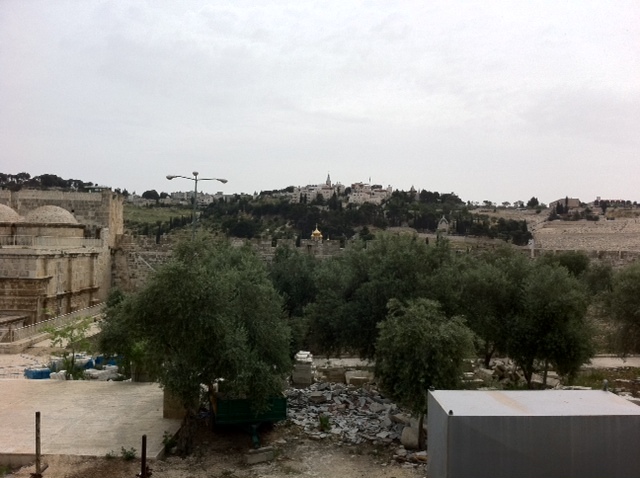 I was able to hike in the very places that Psalms where written… where David slayed Goliath. I mean, seriously: That’s priceless! I will never read these stories the same. So ever since I’ve had this insatiable desire to read my Bible for a good hour each day. So, here’s the deal church: I want to birth some of this passion into your heart as well. For starters… I want to lead a Substance trip to Israel (so start saving your cash). Secondarily: You don’t need to travel to Israel to get a deeper passion for God’s Word. Sometimes we simply need to start a new discipline. If you’ve ever had the flu before, there’s a point at which you need to start eating again – even though you have absolutely no appetite. It’s a hard place to be in; yet, if you don’t start eating again, you’ll starve. I.e., Sometimes you’ve got to force-feed. And over time, your appetite will not only return but, you’ll actually start to hunger for the very things you’re feeding on. And the same is true with God’s word. P.s., I was sitting in a Beduin tent in the southern desert of Israel… and guess who I ran into? …A high-school student who attends Fridley High School! Seriously, what are the odds? The last couple weeks I’ve been hitting many of the top statistical predictors of healthy kids and marriages. And in case you missed a few weeks due to all of these naughty snowstorms, make certain you don’t miss “Awkward Family” Parts 3 & 5! They are critical for any younger family (click here to see videos). But my wife and I want to give you some more information that you can explore on your own. Of course, if you know my wife at all, you’d know that she’s obsessive about being a great parent. In fact, I call her the “Mommy-ologist” because she’s always got at least 2 parenting books on her at any given moment. (I’m not kidding. It’s almost ridiculous). In fact, I don’t think we’ve gone on a vacation in eight years where she wasn’t reading another parenting book. So, when it comes to parenting advice, what are the books that stand out amidst the clutter? Below, my lovely lady, (a.k.a., “Dr. Mom”) gives us a few of her favorites – and why! 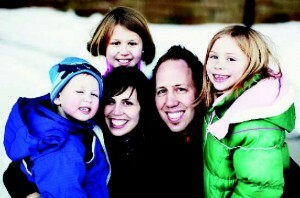 “As many of you know, Peter & I were already senior pastoring a church of middle aged families before we had any kids. So, as you would imagine, our first child was quite the ordeal. (She was the church baby). For better and for worse, all eyes were on us as we entered this new adventure of parenthood. Too add pressure, our firstborn was off-the-charts “spirited” (it’s the nice way of saying ‘obnoxiously strong-willed’). In fact, the expert that made this assessment even recommended that I find a support group! But, don’t worry: everything worked out fine. In fact, all of those humbling parenting moments caused me to seek out all the books, mentors, and wisdom I could find. Unfortunately, many parents don’t do this until it’s too late. Obviously, the Bible is the ultimate source of wisdom (Jer 33:3, Jms 1:5, Psm 32:8); so, don’t forget this when you read my list below. Also, contrary to folk-wisdom, good parenting is NOT an innate skill. If anything, we all have a fantastic ability to screw up our kids. That’s why we need to treat parenting as a skill that needs constant sharpening. Isolating yourself from advice is one of the worst things you could do (as irritating as opinions can be). But, if you have the right mentors and parenting books, God can make parenting a joy – which is how it should be. So out of my journey of seeking wisdom over the last decade, here are a few of my favorite parenting books! Of course, there are hundreds of “good” books. Naturally, it’s hard to narrow things down to a top 4 or 5. But, I tried to pick books that are fun, practical, and easy to read. Thus, my truest test: Which books do I tend to recommend the most? Well, here’s a few you should read (In no Particular Order). 1. Creative Correction, by Lisa Welchel. This is the most life-giving parenting book I’ve ever read! If you have a toddler or older, this is a MUST READ. It is well written, funny and filled with scriptures. (In fact, when you read it, you’re actually encouraged rather than overwhelmed… which, sad to say, is a common occurrence with many books.) But, Creative Correction is full of tools & tips for every age & season your kids go through. So just buy it: You’ll want to read it over and over as your children grow. 2. Nurture by Nature, Understanding Your Child’s Personality Type – and Become a Better Parent, by Paul D. Tieger & Barbara Barron-Tieger Details: For help with kids of all ages. Most parent / child conflict is due to personality conflict. So this book gives you fascinating insights into your kid’s incredibly specific personality type (one of 16!) This book will eerily describe each of your kids (from toddler to teenager) and how you can best parent them in each season. (4) Revolutionary Parenting, by George Barna — Details: A perfect book to educate parents on statistical causes of success. Barna surveyed over 10,000 young adults who are thriving in their faith and life. He then interviewed their parents and came up with some incredible insights on what we can do as parents to be intentional in our parenting. So get ready to produce spiritual champions! (5) Boundaries with Kids, by Dr. Henry Cloud & Dr. John Townsend — Details: For penetrating insights about kids of all ages. This book does a great job outlining the building blocks that create healthy adults. But get ready, you’re going to learn a lot about yourself when you read this. It’s hard to see the strengths and weaknesses of your own upbringing until you’ve read a book like this. Again, this is a must-read. But here’s the bottom line: The average parent only spends 15 minutes a day interacting with their kids. And no matter how smart you are, this type of apathy will never produce healthy results. For some of us, this means we need to take a serious look at how much we work (or perhaps a deeper question, how much do we really need?) But if you’re willing to educate yourself — and if you’re willing to put in a little time — your children will be a treasure both to you and to the kingdom of God. Ever Done a Dorky Mission Trip? Have you ever been on a dorky missions trip where you didn’t really do anything? I have a friend on the mission field who used to host various mission teams. And over time he started calling them “vacationaries” rather than missionaries. Like many other Christians, he knew that there had to be a better way of doing short-term missions. And over the years, I’m starting to agree. To make matters worse, there’s such a dizzying array of mission organizations vying for our attention. I’ve been on many great trips with organizations like Operation Serve. But I’ve also been with a few other organizations that were mediocre…at best. Of course, every other week, we’re approached by a different organization wanting us to send a team somewhere. Certainly, I’m excited that everyone is passionate about bringing Christ to the nations; yet, I’m also deeply concerned that our lack of strategy is becoming quite wasteful. That’s why, just recently, we called up our friend Rob Hoskins and One Hope organization to do some strategic consulting. For those of you unfamiliar with OneHope.net, they are one of the most thoughtful mission organizations on the earth. With hundreds of employees around the globe, they’ve engaged over 600 million youth with the scriptures in 125 countries. In fact, they’ve done some of the best missiological research I’ve ever seen (see www.SpiritualStateOfTheChildren.com …it will blow your mind). You simply name the country, these guys have a pretty well-informed strategy and network to reach it. So, who better to help develop Substance’s very own missions strategy!? One Hope was generous enough to fly up five of their brightest minds from their headquarters in Fort Lauderdale. (Of course, the thought crossed my mind that we should have reversed the location : ) To be honest, our executive team was a bit nervous hosting such a brilliant crew. I felt like the dorky 7th grader asking the popular girl to dance. But all is well. The One Hope crew is a riot. (I think we’re even “going steady” now : ) But seriously: These guys rocked my world. I’ve never in my life heard such a fantastic and strategic approach towards global missions. For example… most people think of “missions” as merely a budget of the church, not an extension of the churches’ greater calling. In other words: Every church has a strategic “missional gift-mix.” For example, some churches have a large quantity of construction workers, videographers, or medical practioners. Yet, very few churches develop their missions strategy in light of this gift-mix. Even worse: Church mission trips become nothing more than wasteful vacations that put a huge burden on the foreign mission base – yet do little to actually grow the churches in those countries. Even worse: Some countries are far more strategic to reach than others. Yet, many churches mindlessly take trips to countries that are already over-saturated with aid. And just as bad: Many mission trips aren’t even connected to thriving indigenous churches. And if they are connected to churches, they rarely serve the strategic needs of those churches. In the end, there’s very little thought given to “What are the most strategic churches to be serving.” And the reason is usually because, very few missionary organizations are as well connected as One Hope. Thus, everyone seems to go with their aunt’s cousin’s mom & pop missionary church. Yet, just down the road, there may be a wildly more fruitful church to be serving. But at Substance: When we spend our missions dollars, I want it to be on the most effective kingdom efforts on earth. And if we take short-term mission teams, I want to use Substance’s strengths and go to strategic nations and then work with carefully selected churches who are fully capable of fully utilizing our short term efforts for long-term gain. Even more, I want to send teams to foreign churches that are fully capable of healthily converting our short-term missionaries into one or two year missionaries. But many churches are incapable of healthily absorbing westerners without harming the church or the well-intended missionary. Yet none of these things will ever happen if American churches are constantly distracted with mediocre mission-trips to mediocre countries doing mediocre things with mediocre foreign-churches with out any long-term measurable goals. Of course, many church strategies work through one or two of these things; but, I’ve never met an organization like One Hope who can create an elaborate missiological business plan that factors in all of these things. (Can you feel my excitement!!!!) DUDE! I am so pumped! Perhaps it’s because, I believe that we are designing far more than just a church missions strategy. I feel like we’re designing an entirely new way for American churches to do missions. Every ten years, there’s a new “missions bandwagon.” There are a lot of mission projects that “preach well”… like disaster relief or trafficking. (Both of which I whole-heartedly support). But I sense God’s heart is crying out for more from us! We need “God-ideas” not “good ideas.” And the only way we’re gonna discover this is if we do our homework and then bathe all of it in a good amount of prayer. Make sense? But one thing is for sure: I believe God wants Substance to be a model of thoughtful missional outreach. So keep praying Substance! We’ll be unveiling our new strategies over this next year. But remember: this is just the beginning. Peter Vs. The Volcano … and I lost! Can they really cancel your flight while you’re ½ way across the north Atlantic Ocean? Apparently so! As many of you know, I was off to South Africa via Amsterdam to preach at a pastor’s conference north of Johannesburg. 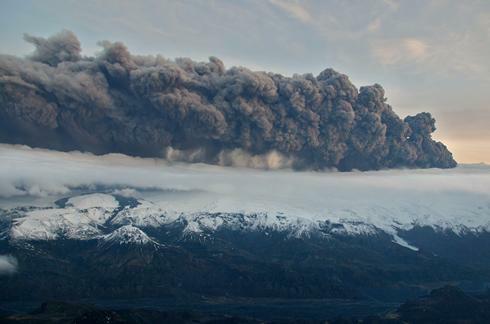 And all of a sudden, that naughty little volcano in Iceland (who’s name no one can even pronounce) came along & coughed up a good amount of ash into the air. Of course ½ of the airports in Europe were suddenly shut down. So, what does one do? Apparently, one turns the plane around and goes all the way back to Minneapolis. Of course, every subsequent flight was instantly booked throughout most of the week… unless I wanted to spend $5 grand routing myself through China. By the time I would arrive, I’d have to jump right back on an 20 hr flight just to make it back in time for Substance. I mean: Come On! At the very least, this stupid volcano should have a pronounce-able name. At least, that way, I could hurl insults at it. (I suddenly understand how Clark Griswald felt when Wally World was closed.) It had felt like such an epic journey… & yet now I’m back home for the week. I thought about that Proverb that says: “Hopes deferred make the heart sick.” Have you ever experienced that before? Life has its share of twists and turns. But, as I grow older, I’m starting to see the silver linings more quickly. Romans 8:28 says that “God causes all things to work together for good for those that love him.” So, I’ve been trusting God that He is having his way even when it’s different than I expect. Interestingly, on my North-Atlantic “site-seeing tour”, I got to sit next to a believer who helps lead at a great church that Substance is friends with. (Seriously…What are the odds?) We had some fantastic leadership discussions. And I can’t help but to suspect that God was simply planning a very unique and extravagant fellowship moment. It also hard to feel bad when it’s 80 degrees outside. I immediately bought tickets to a Twins game this week. And I’m still hoping to see a lion… even if I have to go to the Como zoo to do it. Of course, I realize that many of you are having tough times…. perhaps in your finances, emotions, your marriage or job. And you may not have naughty volcanoes causing the problems; but, no matter what the cause of your burdens, remember this: “[God] will never let the righteous fall.” Psm 55:22. He has a fantastic way of turning tests into testimonies. So, don’t let your emotions take you down. Let your faith build you up… even if you’re forced to have a South African BBQ in Minneapolis! All right? I love you guys! Thanks for all of your prayers! “So, then: How do you travel and stay fresh?” Well, I’d be lying if I said I’m “fresh” right now (& I usually blog when I’m procrastinating sermon writing : ) But, truth be told, I usually know in advance when I have a busy stretch; so, it’s not uncommon for me to get my sermons done five weeks in advance. So, I always make sure that the Lord and my family are still my priority. For example, one of our biggest dilemmas at Substance is: “How do we afford a basic building project, when ½ of our members are college students?” Up till now, we’ve cut costs by being a portable multi-site church. Yet, at this size, portability is now costing us as much as the would-be mortgage of a permanent worship center. But how do we raise a down-payment? And how do we keep our core values intact while we do this? Thankfully, I’ve got dozens of mentors who’ve navigated this without becoming like those facility-obsessed corporate churches that we’ve all been scared of. And, every time I hang with them, they give me organizational insights which have already saved Substance hundreds of thousands of dollars. (2). But the Second reason I travel is this: God is wanting to speak to the American church through Substance. Recently, I was sharing about how much I hate travelling. And truth be told: I enjoy speaking to new audiences; but, I don’t have any deep ego needs to stroke by doing it. In fact, sometimes, speaking out is nothing more than a burden to me… because it often simply means that there will be hundreds of new people vying for my time, money and resources. Yet, recently, a Substance member told me: “Pastor, I’m praying that you start loving to travel… after all, you’ve got a message for the body of Christ at large that needs to be shared.” And, God must be answering her prayers because, the desire in finally increasing. To make matters worse, misguided Christian leaders everywhere spend all their time bickering about complicated theology and church methods. It’s like we’re standing on a sinking ship debating about it’s engine. Yes. Engines are important; but, not when it’s sinking! What many Evangelical leaders fail to realize is that: If we can’t even get unchurched people to even step foot in ANY Bible believing church of any kind… then all of our silly “Christian debates” are all for nothing. The best mid-week discipleship program in the world is useless if we can’t even bridge the massive chasm between our Christian sub-culture and the vast majority of Americans. And, dog-gonit… I would rather rip the skin off of my body than watch Evangelicals and Charismatics stay on the same silly course (O.k… so, perhaps that was a bit dramatic). And that’s the last reason I travel. Right now, I’m looking out my airplane window and it’s amazing how far I can see. I get perspective. And the same is true as I work with the body of Christ at large. I don’t want Substance to become some cloistered group of myopic Christians with no “Big picture” of the body of Christ. God wants us to become a movement. And to do this, I must move with the movers. I.e., I must travel. But the result: More mentoring. More clarity. More opportunity for Substance to hold a torch for the American church. So get ready Substance: our best days are yet to come. I hope that everyone has been enjoying our teaching series: “When Life Gives You Lemons.” I think we’ve all had bad things happen to us; so, there’s something so cathartic about talking and laughing about it. One of the most powerful truths that we can ever learn: God is near…even when life is difficult. So come deepen this conviction on Sun. Nov. 1st! Brett Favre’s Daughter at Substance? Yes indeed, Brett Favre is coming to the Minnesota Vikings. Who would have thought? Of course, many of you know that I grew up in Central Wisconsin where they literally worship the Packers. As pastor Lombardi once said… I mean coach Lombardi: “The three most important things in life are family, religion, and the Green bay Packers.” And this was really serious. (Of course, you have to live there to understand it…& part of it is because there’s not much to do there : ) But the vortex of Packer football is almost impossible to resist if you really want any friends. By the time I left Marshfield, I had experienced 8 solid seasons without missing a single game… (even my wife became a regular fan). Even more, I had made numerous pilgrimages to Lambeau… one of which was that Monday night Packer-Viking game where the Pack won in overtime (you know, that game when it was pouring rain & the ball bounced off of Antonio Freeman’s back shoulder then landed in his hands for the touchdown)?? I still tear up when I think about that. (& if you’re a Viking fan, you probably do too). So when we decided to plant a church in Minneapolis, the #1 question from our previous church was: “How are you planning on staying true to the green and gold while living there?” I mean, people were truly concerned for my NFL salvation. I even had church members from Wisconsin offering to buy Sunday ticket on Directv so I would never miss a Packer game (it was offered like missionary support). But I kept telling the people: Listen church, I cannot antagonize the people of Minneapolis and still minister to them. I’ve got to be willing to open my heart to Viking fans. Yet, their only solace was when I told them that I would adopt the Vikings like Abraham adopted Ishmael. I could love both of them as my sons, but only one team came with the Promise… (specifically referring to Favre). So you could imagine my shock when I heard that Favre was coming! It felt like God was reconciling my two worlds. (I’ve actually had dreams that Favre and I became good friends). Of course, I was pretty angry when the Packers gave Favre the boot. Sure, he put them in an awkward position; but, for goodness sakes… he’s not only a legend but he brought them to the NFC championship only months earlier. I actually became a Jets fan for a year just to get over it. So here’s the cool part. Rumor has it that his daughter is coming to Mpls for college. And you all know that Substance and college students are like chocolate and peanut butter. Of course, Favre’s daughter is not coming to Substance, as far as I know (that was just a gimmick); BUT, I beguiled you with good purpose… Prayer. In a week in a half we are launching a new Substance campus at Northwestern! And Substance, this is our Super-bowl moment; because, we’re estimating that we are going to grow by around 400 people in the coming 2 months! So we need you to be praying like never before. We cannot afford to cruise into the fall without being prayed up. And, I suppose we could pray for Wisconsin too. After all, Favre coming over here is nothing short of a state-wide church split. So, Viking fans… I hope that you lend a compassionate hand towards our conflicted Wisconsin brothers. After all… good things do come from Wisconsin… Right? But, seriously, he’s kind of a hero to me. So when Billy Hornsby, the President of the ARC church planting organization, asked me to speak at a small church planters conference at Craig’s church, I was freaking out. After all, I’ve seen so many video messages of Craig, it was rather surreal to actually stand on the same holy stage and teach others. In fact, when I put on the headset microphone & wireless pack, it said, “Groeschel” on the side. Immediately, I felt like I was holding a sacred relic! …you know… as if I was wearing Michael Jackson’s silver glove, or wearing Elvis’ belt! I mean, this was the very same microphone that has blessed me over and over again! I felt like I was borrowing the Fonzes’ leather jacket! (Yes…I was a child of the early 80’s). And right before I was about to take a picture with me cuddling it… (you know, for staff humor that would only make sense to my staff) it started giving feedback… so the sound guy had to switch it out. But I still had time to wipe off some of the anointed sweat. (again, I hope you know I’m kidding). Of course, the conference was really amazing. The video feeds will be seen by thousands of people. And, I got HUGE feedback from a good number of church planters. But despite the amazing conference, I still wasn’t able to meet Craig! So, a bit deflated, I was at the airport, getting ready to fly home. I had just ordered the most amazing footlong chilli-cheese dog to console my milieu of emotions; and, take a wild guess who was behind me at the airport?! It was Craig Groeschel… in the flesh! Immediately, I was star-struck (which doesn’t happen very often). A few awkward words flew out of my mouth. And it turns out: He knew who I was! Can you believe that? He’s heard stuff about Substance! What a crazy deal! So listen up: As fun as that was, there is something far more amazing that I want to make you aware of: God Himself knows your name! I mean, THE God who created the universe… the author of all life… the maker of all things, knows who you are and is knocking on your door! …That’s CRAZY. I mean… as great as it was to meet a hero of mine, it is a far greater privilege to be able to meet with Christ himself through prayer. In fact, it’s almost mind-blowing that such an important person would even care enough to initiate friendship with us, let alone meet with us. After I gobbled down my endless hotdog over good fellowship, I had a great moment with God today. 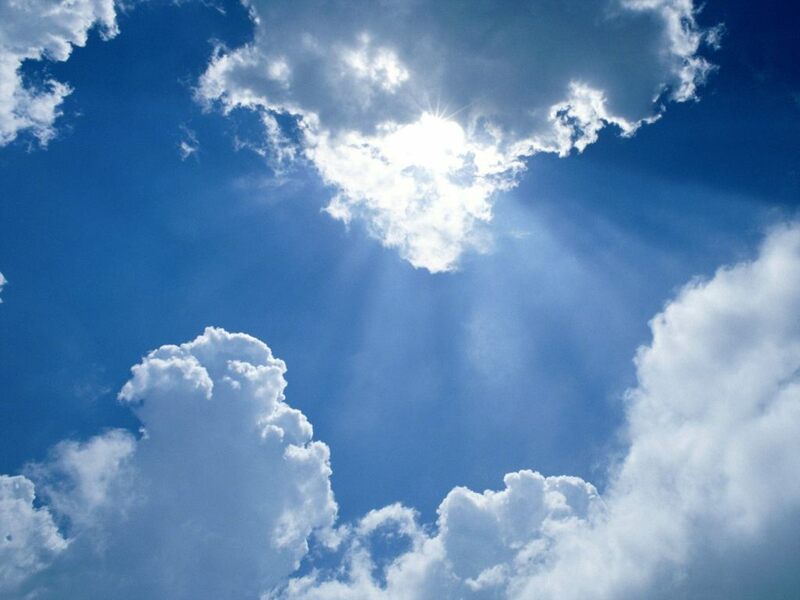 I’m looking at the clouds outside my window; and, I just know deep down in my heart that he’s smiling at me. He love to bless his children. So wherever you are, whatever you’re doing, don’t let God’s invitation to meet with him go unanswered. With such an invitation as this, we need to spend time with him. After all, He’s not just good. He’s Great. But you can’t take my word for it. You gotta experience it for yourself!